Better mobile messaging for Android is on the horizon. As part of the Mobile World Congress festivities, the GSM Association announced that it’s partnered up with Google and 15 global carriers to push adoption of Rich Communication Services (RCS). RCS brings the features found in third-party services like Facebook Messenger, WhatsApp, Hangouts, and others to standard messaging, such as real-time typing and read notifications, support for higher-resolution images, location sharing, and emoticons. Just like with Apple’s iMessage, you won’t have to sign up for another account with a third-party service, as it will be integrated with your phone’s standard messaging. Google has pledged to build a dedicated RCS client thanks to its acquisition of Jibe, a carrier-based messaging platform. This would enable carriers to tap into Jibe’s platform in order to deliver RCS, or they can build their own infrastructure. 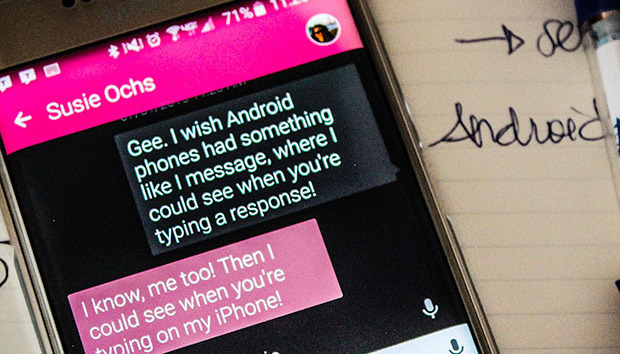 T-Mobile has already rolled out some support for RCS with its own Advanced Messaging service. Expect to hear more about this at Google I/O, as that’s usually a prime venue for Google to announce new initiatives or expand on major projects. Why this matters: SMS and MMS messaging can be a pain point for Android users when compared to the iPhone, which offers a zippier, although proprietary, system with iMessage (which is not without its own issues, it should be noted). RCS is exciting because it can bring this type of capability to everyone regardless of device. Though how much Apple would support this remains to be seen, as universal and open standards are not usually the company’s forte.